Food is one of the largest expenses for many American households, right after housing and transportation. Food accounts for around 12.5% of their spending. The good news is that your food bill is one of the easiest to reduce. Housing and transportation tend to require longer-term planning. However, when you learn how to save money on groceries, you can implement the strategies almost immediately. One of the simplest things you can do to reduce your grocery budget is to plan. You can also try to create as many meals from scratch as possible. Pre-cooked or ready-to-cook foods are rarely the best deals. For example, veggie or fruit trays may seem convenient but they are usually costlier that if you buy whole produce and do your own cutting. Of course, you will have to set aside the time for meal prep. However, this is a trade-off for saving money and reducing your grocery budget. The tips below include everything from comparison shopping to using coupons and planning meals around what’s on sale. It may be difficult to adjust to this new way grocery shopping in the beginning. However, it will get easier with time. Get ready to shrink your grocery budget with this comprehensive collection of tactics. Click here for even more money saving ideas you can start implementing right away! Start by eating before you go grocery shopping. Yes, really. When you shop on a full stomach, you’re less likely to buy snacks and things you don’t need. When you’re hungry, you have less self-control and may purchase not just snacks, but household items and other things you don’t need. Make sure you make a list before you leave home and stick to it. The list should include the ingredients you need for the week. Buy only what you need to make your menu a reality. If it seems difficult to plan meals for an entire week, start with a four-day plan. You can gradually increase the days as you get more comfortable. Shopping only once per week can help you save money and stay focused on sticking to your grocery budget. You should also shop when you have lots of energy. If you’re tired and worn out, it will be difficult to focus and make sensible choices. If you need to shop when you’re tired, do so in familiar grocery stores. When considering how to save money on groceries, think about you can find exactly what you need quickly in stores you know well. Your local stores may publish weekly ads in the paper or on social media. You can look for these and plan to incorporate sale items in your shopping. You can then plan your meals around items that are on sale or ingredients you can buy in bulk quantities. This is a relatively simple method since all you need to do is look for the ads. Different stores will offer different sales each week. By rotating where you shop, you can get a wide variety of items. You will be able to eat a range of foods at discounted prices. When you use your grocery budget calculator, you will realize you can save quite a lot. Additionally, when you buy large amounts, you can freeze food items for use at a later date. When you are first planning your grocery budget, you should do a price comparison at the stores you frequent. You can simply write down how much your usual purchases cost or use an app like Basket, Favado or Grocery Pal. Don’t miss out on cashback with Ibotta when you buy your groceries each week. Sign up now, get a $10 sign-up bonus and start earning money back! After you have bought your food following careful planning, you need to ensure it does not go to waste. Try to cook enough food that you have leftovers for the next day or you can freeze leftovers for a meal another day. You can also package your own snacks if you’ve bought an economical large package. You can grab a small baggie when you have to run instead of buying snacks while you’re out. Also, you can try to buy fewer pre-packaged snacks and make your own combos. Take some time at the start of the week to cut up fruit and vegetables. You can grab these for snacks as well. Keep basics like rice, legumes, spices, canned meats, and flour in stock. You can make a quick meal if you’re pressed for time or can’t be bothered to do a lot of work. Be sure to check your fridge and cupboards each month and use what you already have before buying more. It helps if your food is well organized and you can clearly see what you have. If you can’t see your items, you may end up buying things you already have. If you choose to buy food in bulk, make sure to keep an eye on the expiration dates. Package foods so they will last as long as possible. For meats, pre-cook or marinate them and then freeze them. When you have food almost prepared at home, you’re less likely to spend money eating out. Don’t forget to take back your bottles and cans so you can get the deposit you paid. This will put some extra cash in your grocery budget. Check out this article for a lot more kitchen hacks and cooking tips to help you save money and avoid waste. Try some new foods if the price is right. It is easy to purchase the same cereals, vegetables, and juices every week. However, if you try a cheaper alternative, you may realize you like it just as much or even more. Don’t be afraid to try new things. Take your calculator with you when you go shopping and add up your purchases as you put things in the cart. You should also do the math to see if 3-for-1 offers or larger packages are really the better deal. This will typically vary by product. If you have children or other young relatives, you can give them this task. This will help you save money on groceries. Consider learning to make more of your favorite food. You can take a cooking or baking class or ask a friend for help in expanding your skills. Buy non-food items like sandwich bags or paper towels at the discount store or get the house brand from the supermarket. Many are made by the same company but simply carry different names. Be careful with sales. Don’t be tricked into buying items you don’t need. Consider using a smaller shopping cart. This will reduce the amount you are able to pick up and there limit wasteful spending. When you don’t have a lot of room to place groceries, you will have to think carefully about if you really need each item. Ask store staff for a rain check if they run out of an advertised deal. This will allow you to get the item at the sale price when it is in stock again. Just make sure you take careful note of when the rain check expires. Be sure to keep an eye on the cashier as your items are scanned. Sometimes items are mispriced. If you don’t pay attention, you may end up being overcharged. Click here for more useful tips on how to stop wasting money when shopping online. Popular grocery stores like Winn-Dixie, Publix and Safeway have loyalty programs. These can help you to get significant bargains. Retailers also offer email newsletters that may include digital coupons or other ways to save. You will also find grocery store coupons in your local newspaper. Coupons can result in massive savings so take the time to look for them. Many credit cards also offer incentives for grocery shopping. Just make sure you understand when grocery rewards are being offered so you can do most of your shopping at this time. Some credit cards offer 5% cash back on categories which rotate quarterly. You may have a maximum quarterly spend of up to $1,500. If you don’t want that much in groceries, you can use the card to buy that amount in gift cards. There are several legitimate options for getting cash back on your purchases. One of them is Ibotta, an app that will reimburse you if you submit a copy of your receipt. All you have to do it sign up, select the cash back offers that interest you, and start shopping! When done, simply upload your receipt to redeem your offers. Ibotta will pay you back in 48 hours tops. After that, you’ll be able to withdraw your funds to PayPal or Venmo. Click here to sign up for Ibotta, get a $10 sign-up bonus, and start earning cash back on your purchases! Another great cashback option is Affinityy, which allows users to get money back on their online purchases, including groceries, every day. Affinityy has partnered with hundreds of top companies worldwide to bring shoppers multiple discounts and cashback options. Payments are made directly via PayPal once you get a minimum of $50 in your account. Sign up to Affinityy today to receive a $20-bonus and start getting money back on your online purchases! With Inbox Dollars, you’ll be able to earn cash back by shopping for groceries online, but also by completing many other tasks. Cash rewards are available for taking surveys, playing games online, surfing the web, and more. Users can withdraw the earned funds to PayPal or can opt for a check or an electronic payment. Click here to sign up for Inbox Dollars, get a $5 signup bonus and start earning even more cash online! Grocery stores really want you to part with your hard-earned cash. They use a number of strategies to get you to buy more. For example, some food manufacturers pay to have their products placed at eye levels or specific point around the store. For the best deals, look above or below these items. Your grocery store is also tricking you into buying candy in the checkout line. While you’re waiting for your items to be scanned, your eyes start to wander. Before you know it, you’ve picked up a bunch of snacks you don’t need. If you always get tempted at this point, consider using the self-checkout lane. A study conducted by the IHL Consulting Group found that impulse purchases drop by 32 percent in women and 16.7 percent in men when they used the self-checkout lane. This is because shoppers are faced with fewer temptations. Produce marketed as fresh isn’t always safer and healthier than frozen food. Unless you can verify how it was grown, it may have pesticides or have traveled a long distance. This would cause the produce to lose nutrients. You would be better off buying berries and spinach in their frozen form. When it comes to meat, ask if it gets discounted at a particular time of the day. That should be the time you head to the store. If you want fresh produce that’s also affordable, you should check out local farmers. Try your local Community Supported Agriculture association, especially during the summer months. You would usually pay an upfront fee and then collect produce throughout the season. You may be able to purchase additional shares bread, eggs, cheese, and other items. Another option is to get together with neighbors or friends and start a bulk-buying co-op. Lots of other markets will have cheaper produce and high-quality spices and herbs. You’ll need to buy perishable items locally. However, it is likely that many of the things you eat don’t need to be frozen or chilled. You can purchase them online at lower prices and have them delivered. Many health foods are best bought this way. Things like organic oils and grains, certain legumes and raw honey can be pricey at health food stores. You can find good deals on Amazon or Thrive Market. As with any other shopping experience, be sure to compare prices carefully. Factor in shipping and handling costs and any applicable sales taxes. Some items are only sold in bulk. If you don’t want to stock up, you can involve friends or relatives who buy similar items. Click to read about the purchases you shouldn’t skimp on. Many grocery items can be expensive in drugstores like CVS and Walgreens. However, the weekly deals can be very attractive sometimes. You just need to sign up for the free store cards to cash in on the bargains. You can either register online or do it in-store. Don’t dismiss discount stores like Aldi and the Dollar Tree. There may be limited supply, but the prices are very low. When you’re looking at how to save money on groceries, pop into the discount store. Just do your calculations to ensure you’re really getting a deal. A $1 snack may seem attractive but maybe you can get 3 packs of the same snack for $2 elsewhere. This is the best way to save on groceries like herbs and spices. If you have a small garden filled with your favorites, there’s no need to buy them. Of course, you will need to space and time to take care of your crops. However, small jars or window boxes can be an excellent place to start. You can grow enough mint, parsley, basil, or oregano for household use in a very small space. These herbs would be cheaper, fresher, and more nutritious than anything you would buy in the supermarket. Obviously, this is dependent on where you live and the laws governing hunting. However, if hunting for your own meat is an option, you should look into it. It is cheaper and healthier than buying meat at the store. Of course, you need to have hunting skills and know how to handle the meat safely. If you live in a hunting area, ask around and see what is available. You may also be able to purchase wild meat from someone else in your area. If you can get this or any other meat in bulk, learn how to freeze and thaw meat properly. This is important, so your purchase doesn’t go to waste or your family doesn’t eat unsafe foods. Food shopping bills are relatively easy to reduce. If your household’s spending is getting out of control, you may want to begin here. 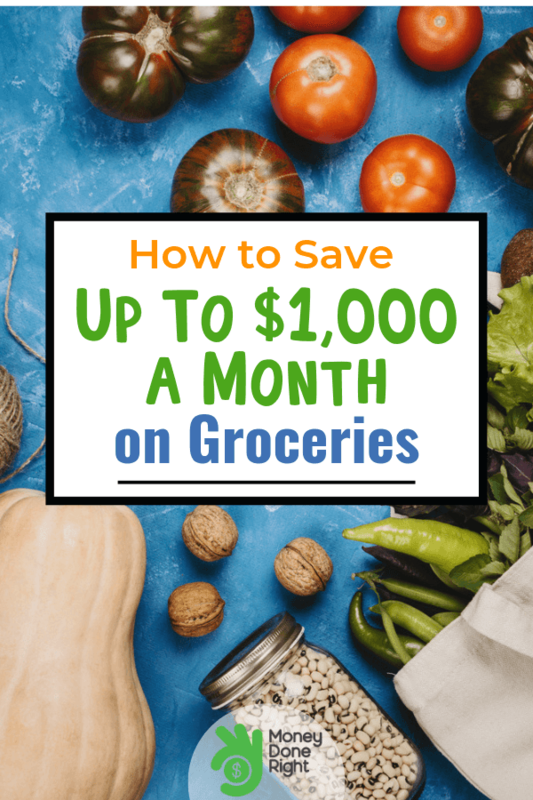 With just a few adjustments to the way you do your shopping and cooking, you can save up to $1 000 per month. If you know the right strategies, you can eat healthy, affordable meals on a consistent basis. Planning ahead and making the most of your resources is key as you try to determine how to save money on groceries. How do you currently save money on groceries? Which of these tactics are you most excited to try?